The long awaited route is finally here. 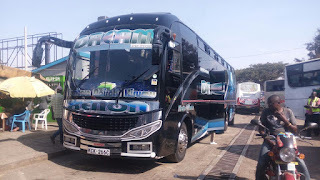 Dreamline Express one of the fastest growing bus company in Kenya launches its Kitui route on Sunday 20th August. The route which was highly anticipated will now be offered at a daily basis by the company. The Bus Company of recent had launched its new fleet of Zhongtong buses to enhance the continuity in comfort and luxury for its customers. Mtwapa - Kitui route will be charged at a travel charge of Ksh. 1300 from mtwapa. The bus whose final destination is Kitui will also have onboard travelers from their Mwembe Tayari, Mombasa office. Travelers to Machakos can also board the bus to Machakos as it enroutes to Kitui. To make reservations or bookings, visit any Dreamline Offices near you. Dreamline Express, Your Dreams We Fulfill..